I’m a creature of habit. I tend to ride the same routes. I know where I’m going. I know what to expect. Sometimes though, I want to try a new route. New climbs. New views. Variety. When it comes to finding those routes, I struggle. I can certainly go to RideWithGPS, Strava or Cyclestreets and find a route that someone else has posted. The problem comes in knowing whether the route is any good. Is it suitable for me? Has the poster a different attitude to what constitutes a safe road? That’s where it can pay to go with a collection of curated routes, where an expert has done all the route-finding hard work for you. London Cycle Routes is just such a collection of curated routes. So What The Rod Hull Is It? 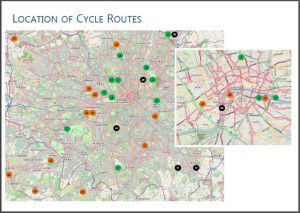 London Cycle Routes has been created by Andreas Kambanis, founder of the hugely-popular London Cyclist blog. It contains all the information that you need to ride 35 cycle routes in and around London. 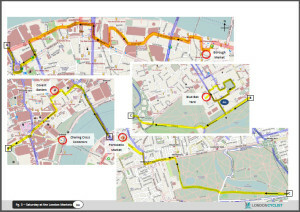 GPS files for each route, which you can upload to your Garmin (other bike GPS devices are available) or smartphone. Each of the GPS files is available in a GPX, TCX or KML format (essentially meaning that all the bases are covered). It costs a shilling less than £10. I imagine that half the challenge in making something like this is deciding which routes make the grade and which to leave out. Andreas has settled on 35. Which sounds like a good number to me. The routes are spread around the 4 corners of London. The routes are more concentrated in central London, but there are plenty in the suburbs and out into Surrey, Kent, Essex and Buckinghamshire / Hertfordshire. It’s probably worth saying that not all of the routes take place on roads. Some are off-road rides, requiring a mountain bike; some are on unmade paths, where a hybrid bike or the use of wider road tyres may be more suitable. As the name suggests, the easy rides are aimed very much at the leisure end of the cycling market. They are perfect for tourists and visitors to London who have hired a bike for the day (or hopped on a Boris bike), or for locals that want to deepen their enjoyment of their home town. The rides are nicely themed. The ‘Towpaths and Narrowboats’ route centres around the Regents Canal. ‘Quirky London’ takes you past unusual landmarks you would otherwise miss (London’s narrowest street; ‘fake’ Georgian houses; a tank). ‘Saturday at the London Markets’ is a neat idea, taking the rider from east to west London, visiting each of the markets en route. As the leisure rider would no doubt hope, the routes (and their descriptions) are liberally sprinkled with ‘places of sustenance’ (liquid). Andreas obviously enjoyed the research aspect to this guide. The medium routes take a similar approach to the easy ones, but use the added length (and therefore duration) or busier roads to span more of the capital. Hence ‘Parks & Dinosaurs’ takes riders from the hills of Crystal Palace in the south-east of the city to Regents Park in the north. The 35-mile Jubilee Greenway ride, which circumnavigates the capital, via the Olympic Park, looks like an epic (but rewarding) ride for most casual cyclists. The hard routes are all road-only. These are more suited to the casual cyclist ready to spend all day on a hybrid or road bike, or to the more serious road cyclist (and some of us less serious ones as well). ‘Tackling Biggin Hill’, centred around the airfield of the same name takes place on road and climbs I’m very familiar with. It presents a robust challenge, surprising for its proximity to London. (I’m undoubtedly biased, but routes like this highlight why, Richmond Park aside, the south east of the capital offers better intra-M25 riding than the south west). ‘Hilly Orpington’ features Toys Hill amongst the climbs, a nice one to tackle if you want to start ticking off the entries in Simon Warren’s 100 Climbs book (although Warren’s book may have you climbing it south to north). Finally, ‘London-to-Brighton’ and ‘Route of the Dunwich Dynamo’ provide handy details for popular cycling events in south east London. The L2B route provided is that of the official British Heart Foundation ride. It will be useful to you if you’re just about to do it, or you’ve missed on a place but still want to try it. The Dunwich Dynamo is a not-short 113 mile ride from … to the beach at Dunwich. The official event takes place at night, with riders arriving at the coast in the early morning light. How Do You Use The GPS Files? In order to use the route files whilst out on a ride, you’ll either need a smartphone or a bike GPS device (e.g. a Garmin Edge 500/510/800/810/1000). The book contains instructions on how to get the routes onto your chosen device. Alternatively, give Andreas’s post on the topic from earlier this year a squiz. If you want a Sportive Cyclist-flavoured set of instructions, you can take a look at my recent post on how I create and upload a route to my own Garmin (you only need to worry about sections 2 and 3 as Andreas has done the route creation part for you, obviously). As I mentioned above, London Cycle Routes is a varied collection of rides, suitable for a range of abilities. It is not a training aid for road cyclists, looking simply for a range of training rides*. Londoners (or south-easterners) that want to get to know their home town better using the medium of pedal power. The routes are well thought out, with interesting themes and novel places of interest. The ride descriptions are clear and engaging. The provision of route files in 3 different formats should cover all the navigational bases. I really like the idea of curated selections of rides. Sometimes you need someone to help sort the wheat from the chaff. As the author of the London Cyclist blog (and by definition a long-time London Cyclist), Andreas is well-positioned to be that curator. If you want to find out more, head on over and take a look. Also, whilst your here. DO sign up to receive Sportive Cyclist by email. I’ve just added a new e-guide to the Sportive Cyclists Toolbox, namely ‘The Time-Starved Cyclist: How To Train When You’ve Got No Time”. Get that, as well as everything else that’s in there, by entering your details in the nice blue box just below this posts. Yes, that one. THAT ONE [points finger vigorously].